Exclusively ours! 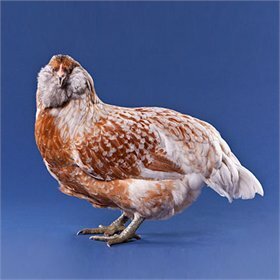 My Pet Chicken developed this new take on our all-time best-selling breed. 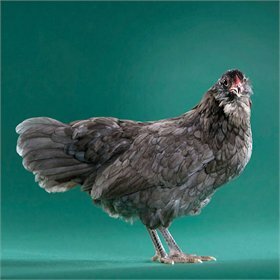 The Blue Easter Egger designer cross breed is just that--a pretty, blue Easter Egger (you won't get splash or black! ), 95% of which will lay five or so green eggs per week. The remaining 5% may lay a brown or pinkish-brown egg. They'll look very similar to Blue Ameraucanas, pictured here. The recipe is a secret, but we're sure you'll love this docile, pretty and prolific breed. 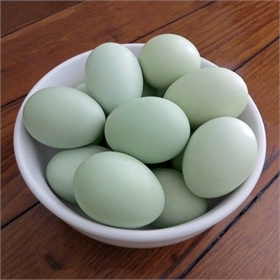 Easter Eggers are loved for their sweet personalities, hardiness in both the heat and cold, and for their large eggs in all different shades of green and blue (a small percentage even lay a light pinkish brown color!). This is why they've topped the best-seller list every single year since we started selling chicks in 2007. 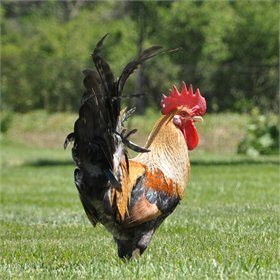 We love EEs for the backyard flock because they don't tend to be aggressive with one another like some breeds can be (Rhode Island Reds, we're looking at you!). They're also super friendly, active foragers, and cold hardy. In their second year and beyond, Easter Eggers are known to lay extra large eggs. They rarely can go broody, but are not excessively so. Easter Eggers are usually bearded and tend to have slate or willow (blue or green) legs. 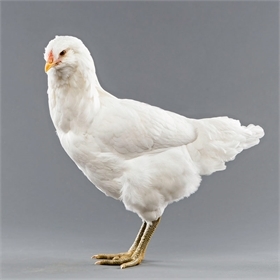 They are friendly, and favorites of children, who love their easygoing personalities and to gather colored eggs.